Wind a path to entrap and obliterate enemies in your large garden of sunkens and unit defenders. Sunken defenses are a dime a dozen dozen, so what makes this map my favorite? I classify Virus as a tube type defense in that one player's enemy spawn is another player's end zone, so the player behind gets the other's leaks (with the other type being bottle, where the player has an enemy spawn and an end zone by himself). 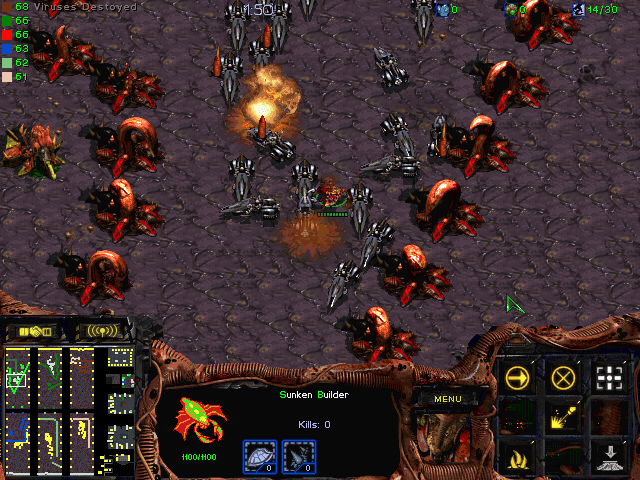 In contrast, when the enemies are spawned at only one point and runs through an open course where any players could build (course type), this creates competition among the team that could lead to grievances and lost fun for the unfortunate player whose defenses' whole purpose is to weaken the enemy for other players to kill (funnel type). Basically, I prefer individual-team defenses where each player gets his own area and enemy spawn so that the fun is evenly distributed. Virus as a featured map offers the freedom of making your own defense maze in a very spacious enemy path. It includes a wide selection of heroes and a flowing amount of Civilians to help strengthen the defense. Like many other maps of this type, the team will face the problem of having a weakest-link player who would leak miserably on Zergling levels. So remember to take some time to tutor the newbies and the whole team will be able enjoy the game further.